I've been loving square scarves lately, and decided that I needed one for the cold weather. I already bought one for my sister and she wears it and looks adorable. So I thought I could make one. And I did! What you see here is a large square (about 32 inches) of what JoAnn calls "specialty cotton". It's a cotton/poly blend that is lightweight and drapes pretty nicely. I just snipped a bit and then tore the fabric so that thee edges get a nice frayed thing going on. Then, in one corner, I stitched some simple circles. Like these. They are done in a red that is close, but not exact, to the scarf, and in a running stitch like sashiko style. Look closely and you'll see them. I love my scarf. You just fold it into a triangle and wrap it around your neck as you see. Simple and sweet. But did you read the title of this post? After I took these photos, I lost my scarf. This was literally the only time I wore it, and I'm pretty sure that it has to be in my house someplace. It's making me crazy, and all my whining about it is making my family crazy! True story ... I just found a scarf I'd been searching everywhere for, stuck down between the cushions in my sofa. So did you check there!? It's too pretty to be lost for good! Thank you so much for this post. I want to let you know that I posted a link to your blog in CBH Digital Scrapbooking Freebies, under the Page 3 post on Nov. 28, 2011. Thanks again. I LOVE the red on red & the simplicity! I hope you find it soon! That is super pretty! I can't believe you lost it!!! How sad! This made me giggle, because it's kind of impressive to lose a big square of bright red fabric. But I'm giggling with you, not at you, because I lose things all the time. 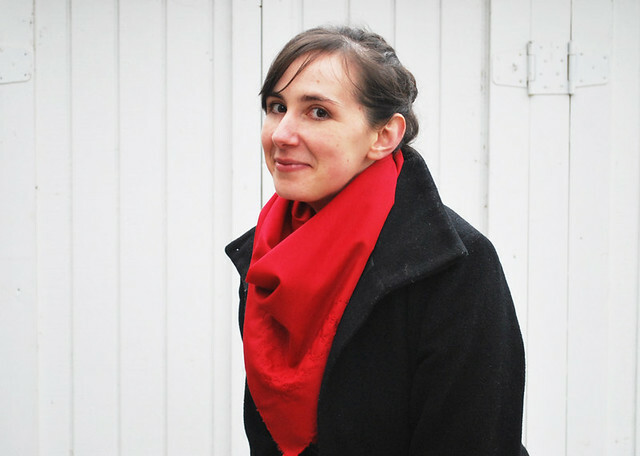 Come back, little red scarf, come back!